I couldn’t agree more. I’ve ridden bmx for a long time and still surprised after seeing so many bmx related brain injuries that so many pro riders still ride without a helmet. I mean, yes, they can do what they want but this video part is glamorizing the pain and commitment that goes into riding bmx. To me, it’s just such a fine line to be walking and an immature decision to make. I hate to see any more people get brain injuries in situations that could’ve been avoided. Selling these Spank Spoon handlebars. They're 740mm wide (uncut), 31.6mm in diameter and they have a 20mm rise as seen in the picture. These bars are in really good condition and I replaced them with wider bars so I have no need for these anymore. There only a few small scratches but these bars a very solid and were never take off any big drops so they've still got lots of life left in theme. Buyer pays shipping and PayPal fees. 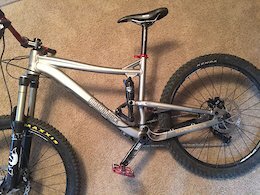 I'm selling my Diamondback Mission frame and stock Fox RP23 shock with it. I have had this frame for a few months and it has been solid. The bearings are still super smooth and the RP23 recently had the oil and seals replaced. 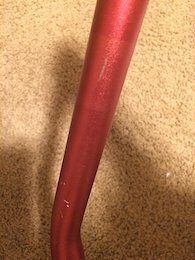 The shock runs and the rebound works perfect but the compression settings/lever doesn't work and it makes a squishy sound in to initial part of the stroke. This is a common problem with these and can be fixed with a rebuild but I never had the need for it. I would keep the frame but its just too small for me and I've bought a new frame to replace it. The frame itself is in pretty good condition and from what I know the previous owner didn't ride it too much. I personally never rode it too hard either. Its got a good scratch shown in the pictures and maybe the smallest dent but I really can't tell. Will ship but buyer pays shipping and PayPal fees. Message me with questions and if you want other pics I can message you them. I'm reading through a lot of comments on here saying that so many new standards are creaded by the big players which I totally agree with but don't see many solutions or incentives for them to stop if they're making money. So many of the standards are also created for the performance gains that are seen at the professional race levels. I might get a lot of crap for saying this but why not get the UCI or the EWS guys to put restrictions on the bikes allowed to race just like with racecars, albeit for a different reason. I'm don't know why they would be willing to do this but does anyone know why this has never been done? This would definitely put an end to all the new standards if their sponsored racer's can't ride the newest standards. #DearGravity Gravity gravity it's such a tragedy, I hate my family had to see this coming out of me. But now it's all over the place, you're such a disgrace, go away go away I don't want to see your face. If I had one wish it would only be this, that without you I could go piss. There's one thing I'd do to rekindle our fire, oh trust me trust me it's my strongest desire. We could travel the globe, working together, bike in my hands flying down the mountains. But there's one thing we'll need, we'll just need an atlas. If we don't get this then we're over. Until then I'll go chill with the mars rover. I know this is a stupid post but i think Terrafire's saying is supposed to be Cheap, Light, Strong. You can get Expensive, Light, and Strong, its called carbon fiber. Posted in "Wheres this washington trail?"